Lyndon Johnson was born 100 years ago today. Here's a piece from mental_floss magazine on some of LBJ's favorite things, including his Amphicar—the only amphibious passenger automobile ever mass-produced for civilians. 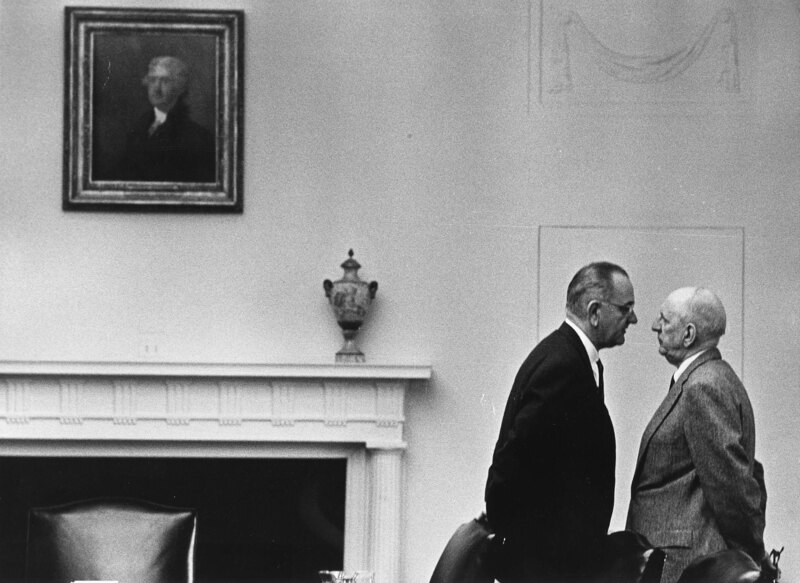 Lyndon Baines Johnson wanted to be remembered as the greatest president who ever lived. With that grand ambition in mind (and an ego to match), he launched such sweeping social programs as Medicare, Medicaid, Head Start, public radio, public television, and food stamps. Regardless, Johnson will probably be best remembered for his blinding arrogance, and what many would point to as the result of it—the Vietnam War. But here, we're choosing to remember Johnson not by the many political wheels he set into motion, but by the stuff he kept by his side—and close to his heart. When President Johnson was visiting his ranch in Texas, he'd invite friends down and take them for a joyride in his car. He'd drive down a steep incline toward the lake, pretend to lose control, and then yell, "The brakes don't work! We're going in! We're going under! " The car would splash into the lake, and as everyone else was screaming, Johnson would be doubled over laughing. Turns out, Johnson was the proud owner of an Amphicar, the only amphibious passenger automobile ever mass-produced for civilians. When people told stories about John F. Kennedy's great female conquests (and they often did), it made Johnson furious. He'd pound his fists on the desk and scream, "Why, I had more women on accident than he ever had on purpose! " And that may very well have been true. Johnson brought a lot of pretty young things back from Texas to work in the White House, even if they couldn't type. He even had a buzzer installed in the Oval Office so that the Secret Service could warn him when his wife was on her way. LBJ loved riding in helicopters. He loved it so much, in fact, that his desk chair in the Oval Office was actually a vinyl helicopter seat—green with a built-in ashtray. In the event of a flood or an emergency water landing, the cushion could have doubled as a flotation device. No joke. Claudia "Lady Bird" Johnson was her husband's most vital political ally. In the early days of their marriage, he could boss her into picking up his socks or shining his shoes, but by the time they moved into the White House, he couldn't give a speech without consulting her first. During the 1960 election, she traveled 30,000 miles campaigning for the Kennedy/Johnson ticket; and after they won, Bobby Kennedy said they couldn't have gotten Texas without her. She played an even bigger role in the 1964 election. That July, Johnson signed the Civil Rights Act, which barred racial and religious discrimination in public places and the workforce. In doing so, Johnson betrayed many good ol' boys in the South, where he desperately needed votes. Enter Lady Bird. Armed with big hair and big makeup, the Texas native spewed Southern charm from Louisiana to South Carolina. And everywhere she went, she handed out her recipe for pecan pie. The hospitality worked. In 1965, Mrs. Johnson held the Bible as her husband was sworn into office. Everyone in the Johnson family had the same initials—Lyndon Baines, Lady Bird, and their daughters, Lynda Bird and Luci Baines. Don't think for a moment that it was a coincidence, either. They named the family dog Little Beagle Johnson. Jenny Drapkin is the Senior Editor of mental_floss magazine. You can read more of her presidential knowledge here.